Cold easterlies hang on… Spring delayed! The cold easterlies predicted have created interesting and unusual cloud patterns across the country. 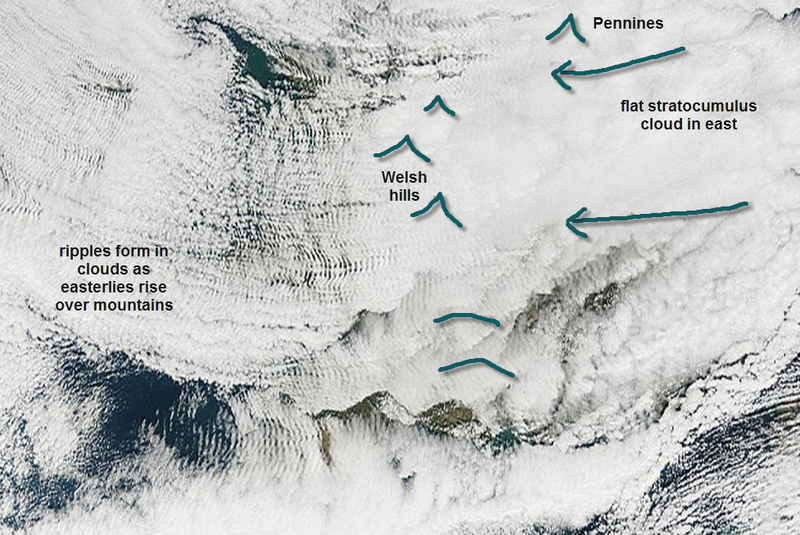 The satellite photo from today shows ripples in the breaking cloud to the west of the hills in Wales and the SW. The easterlies driving the cloud are part of the cold sinking dry air created by the anticyclone to the north east of the UK. The easterlies are forced to rise over the hills and then sink the other side (the “lee-side”), creating this wavy cloud pattern. Another feature of this cold snap is illustrated in the video below which shows how temperatures have changed over the last few days. Notice how inland temperatures drop significantly lower than anywhere near the sea. The sea stays warmer for longer during winter as it takes 5x longer to cool down (and warm up) than land surfaces. The video shows temperatures rapidly falling to low temperatures inland but coastal areas are moderated by the warmer seas surrounding the British Isles. The cold easterly winds and some light snow flurries will continue over the weekend as a weak short-wave trough (a “blip” in the isobars surrounding the HIGH) passes to the north of our region. The very cold pool of upper air is drifting away to the south, so temperatures will recover very slowly through to Monday. However, spring is certainly on-hold at the moment and, despite being a mostly dry week, temperatures will remain lower than average in the continuing easterly air flow. Watch next weekend as a low passes to the north of the UK which could bring a “last hurrah” for real winter conditions as a cold northerly is possibly on the cards. Longer range forecasts give little cheer for us in Reigate and the South East as HIGH pressure seems to stick around to the North and bring in Channel lows to the south of the country bringing wet and cool weather.